Beta Analytic’s marketing specialist Haley Gershon discussed in a recently published article how biobased certifications contribute to consumer confidence. As the demand for natural and eco-friendly products continue to grow, an eco-label could make one company stand out from its competitors. There are many products that claim to be “100% natural” on their labels but present no proof of such claim. Eco-label certifications provide third-party evaluation to product claims. Eco-labels that provide consumers information on the biobased content of a product or packaging material usually require carbon-14 analysis. Biobased content refers to the percentage of a material that is made from renewable sources like plants. Biobased certifications that require carbon-14 testing includes the US Department of Agriculture’s BioPreferred Voluntary Labelling Program, DIN CERTCO’s DIN-Geprüft Biobased certification and TÜV Austria’s OK Biobased programme, among others. Other programs that require carbon-14 analysis are found here. 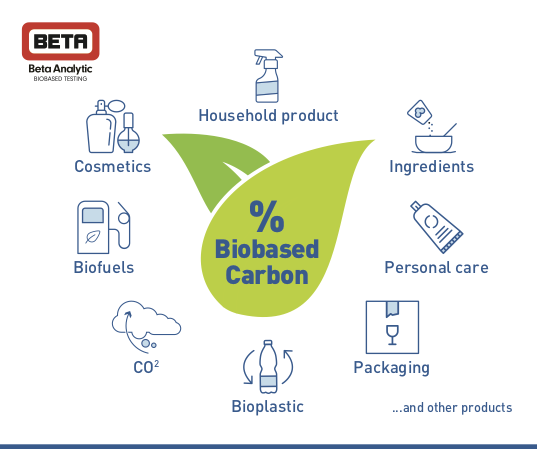 For more information, please read Beta Analytic’s article “Bio-based certifications: The key to consumer confidence” published in Plastics in Packaging News Bulletin on March 1, 2019. This entry was posted on Tuesday, March 26th, 2019 and is filed under Beta Analytic Updates, Biobased Products, Ecolabels, USDA Biopreferred Program .